640 million acres of land in the United States are public – owned by the citizens and managed by the federal government for multiple uses. These lands include forests, mountains, rivers, canyons, deserts, plains and include hundreds of thousands of miles of trails and dirt roads. Public lands are where we bikepack and these lands are under attack. Special interest groups and their political allies are on a campaign to transfer federal lands from the American public to the ownership of states, and in doing so, privatizing the land. This land transfer threatens hundreds of millions of acres of protected land, an American fundamental value – that public land is ours – and it threatens the future of recreation and access to the land through which we bikepack. What is the public land heist? The American government (and by extension, you and me) owns 640 million acres of land that includes national forests, parks, monuments, wildlife refuges, historic sites, conservation areas, recreation areas, Bureau of Land Management (BLM) lands, and other designations. The United States has owned these lands continually since we brought western lands into the Union through various treaties and purchases. If you are a bikepacker, you likely know these lands intimately. In short, while the government does not manage these lands perfectly, they manage them for everyone’s interest and use, and this system has been a improving slowly over the past century. Many laws, all of which are being targeted by the President and Congress, require that the broadest base of public interest be incorporated into managing our public lands birthright. Currently, actions are being taken to transfer our public lands to western states. Individual states offer no landscape-scale rules or frameworks for protecting land and managing for timber, grazing, wildlife, water protection, recreation, clean air, and many other values of these lands. The end goal of this transfer is to deregulate the environment and allow states to sell these lands to oil, gas, hard-rock mining, logging, ranching, development, and other non-public, profit-oriented uses. The difference between state and public land is important to distinguish, as a transfer in land ownership will have deep implications for the future of the land. You, me, our neighbors, the next generations, and everyone who . . .
Enjoys camping, biking, climbing, running rivers, trail running, skiing, or other adventure sports. Most of the time you are recreating on national public land that is managed for good recreation experiences. Owns or works at a bike shop, gear shop, ski shop, or a manufacturer of outdoor gear. Most of your customers use your products almost exclusively on federal public lands. Is an outdoor educator, adventure guide, ski instructor, fitness coach or athlete. Your “office” is America’s public lands. Hunts, fishes, or just loves to watch wildlife. Wildlife habitats are protected and improved by law on public lands. Had a formative experience as a youth on our public lands and wishes for the future kids to experience the same. Works for or is a member of a non-profit organization that advocates for or works on the ground for the betterment of your group’s area of interest. Your involvement is welcome and guaranteed on public lands, and there is no such mechanism for State lands. Agrees that resource extraction is a necessary component of modern society but that it should be guided by a transparent, public-driven review and oversight process. Logging, ranching, and mining on federal public lands is regulated and public input is incorporated into decisions. Breathes air, drinks water, uses toilet paper, walks in the forest or desert, looks at the night skies, and listens to birds chirp. The Multiple Use Mandate imposed on our public lands ensures that ALL of these interests are considered in planning and management. What's the history of public land? Throughout the early colonization of America nearly all of the land in the East was privatized due to no federal oversight of land distribution. By the mid-late1800s, a handful of formative leaders (Roosevelt, Pinchot, Muir, etc.) saw the risks of an entirely privatized land system and the need for land reserved from unrestricted private use. The groundwork for institutions now known as the U.S. Forest Service, National Park Service, and others was formed. Slowly, eastern states had to catch up and buy private land and turn it into public land, which has been successful at a small scale. Now, public land is so scarce in much of the East that even private landowners agree to legally enforceable “Conservation Easements” which often effectively turn their land into publicly available parks and preserves. American’s want access to natural areas and they have fought for it for decades. 1803 – 1912: 220 million acres were given to 29 states to be used at the states discretion to fund education and other public institutions. These are now known as State Trust Lands. In total, more than 40% of the contiguous 48 states’ non-federal land was given away by the government between 1802 and 1976. Most of these lands are now privately owned. That appears to be the end game of many Tea-Party affiliated members of Congress, State Legislatures, rural westerners, and business interests. In 1976, Congress passed the Federal Land Policy and Management Act (FLPMA), which gave BLM managerial authority and conservation mandates over the remaining ungranted and unappropriated public lands in America’s West. In response, the cattle, logging, and mining industries revolted, because they would now have to follow rules for extracting resources on the public estate. Specifically, in Nevada and New Mexico, they galvanized a movement called the Sagebrush Rebellion. Ronald Reagan declared himself a Sagebrush Rebel and then began the slow but steady growth of the anti-public-lands constituency in the rural West. Through the years, that movement did little other than bomb Forest Service and BLM buildings and intimidate Federal employees with death threats. But they were also organizing at the grassroots level, getting their people elected to local, county and state seats across the West. So what, exactly, is happening now? In 2012, the American Lands Council was formed to advocate for the land transfer. It has since worked at the grassroots level with counties and states to move the agenda forward. In 2014, a wave of ultra-conservative Tea Party congress members were elected, bringing the anti-public-lands agenda to Washington D.C. January in 2016, the Bundy’s took over the Malhuer Wildlife Refuge in Oregon. This is a template for more of these takeovers to come, as they were found not guilty on all counts. Over the last few legislative calendars, western states, passed or proposed 54 bills (as of March 2017) that support the idea of federal public lands being given, seized, conveyed or somehow transferred to state ownership. Every western state except California has passed some iteration of these ideas. Despite strong opposition, voiced in numerous polls and public opinion research, Western legislatures are creating the framework to receive a gift of millions of acres of our public lands. The first step in transferring federal land to western states has already happened. House Resolution 5, passed by the House of Representatives on January 2, 2017, includes a single paragraph, added by Utah Representative Rob Bishop (the most outspoken critic of our federal lands system), that states that any conveyance of Federal public lands to a State or other entity shall be considered budget neutral. 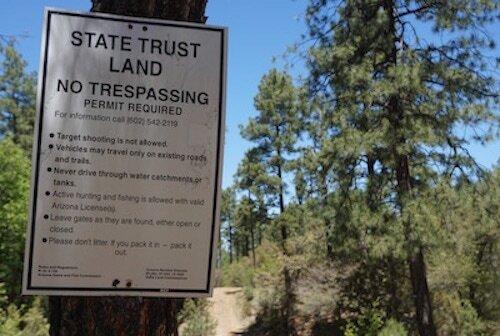 This means that, for example, the Coconino National Forest has a financial value of $0.00, so it could be given to the State of Arizona with no loss of revenue to the Federal Government. While this may sound like a small detail, it’s a necessary step for to achieve the goal of stripping our public lands of regulation and opening them up to more and deeper resource extraction. Because of the rules of the Electoral College and congressional district boundaries, all levels of government across the country are in Republican control. The official Republican party platform calls for our National Forests, Parks, Monuments, Wilderness Areas, and more to be conveyed to the States, where there are no rules for managing multiple uses, and plenty of profit-motive to fill budget deficits with royalties from widespread big-oil development, mining and logging – and outright sales of these lands to developers or wealthy ranchers. Congress has authority to discard public land. When Congress passes legislation to convey our federal public lands to willing western states, it will be up to President Trump to veto any such bill. Given his current record, that is unlikely to happen. Currently, legislation is moving through congress to advance the land heist. What land is at risk? All public land is at risk, particularly the public land of the western United States. Currently, the West looses 1 football field of natural landscape to development every 2.5 minutes. See how the public land of each western state is targeted. Furthermore, an attack on one designation is an attack on all. President Trump's executive order in late April calling for all National Monuments designated since 1996 be reviewed is relevant to the public land transfer because it is an effort to undo federal land designation, protection, and essential conservation laws such as the antiquities act. At this moment, 27 National Monuments are under review by Secretary of the Interior, Zinke. A formal recommendation will be determined at the end of the review period. This process is currently open to public comment; time is of the essence, Bear's Ears National Monument comment period ends June 10, 2017.
Who is responsible for introducing over 132 bills to transfer, privatize, or abolish America’s public lands? There are fifteen lawmakers from western states behind this movement. How do Most Americans feel about the land transfer? Americans value their wild lands. Across parties, the American public values protected land, clean air, and clean water for the current and future generations. The majority of the public opposes selling off public lands to the states. 2016 poll by the National Park Foundation found that 95% of Americans said that protecting National Parks for future generations is important, and 80% would pay higher taxes to do so. 2017 “State of the Rockies” poll by Colorado College found that 58% of westerners oppose ceding management of public lands to the States, 60% oppose selling these lands to the States, and 72% think that public lands support our economy. 2016 “Winning the West” poll by Center for Western Priorities found that swing-state voters prefer a candidate who favors a balanced approach to conservation that preserves public access. 2014 “Western States Survey” poll by the Center for American Progress found that 71% of respondents felt that public lands SHOULD belong to all Americans while only 24% felt they should belong to the States, and that 59% opposed State taxpayers assuming the burden of managing public lands, while only 35% approved of it. Yes! The democratic process is working. Western lawmakers are hearing the local public opposition to the land transfer. Despite being home to a strong faction of the Sagebrush Rebellion and land heist supporters, Nevada legislature has affirmed support for National Monuments and Antiquities Act (May 17, 2017). Nevada congressman won’t revive land transfer bill in recognition it is not something the majority of people want. In response to the executive order President Trump signed in late April calling for a widespread review of public land, 325 bipartisan state legislatures from 44 states sent President Trump a letter of opposition. People are submitting comments in response to the impending National Monument review. Public comments are running 100:1 against the National Monument review. As the narrow window for Bear’s Ears National Monument comment period approaches closure, pressure increases to extend the comment period. Congressman Jason Chaffetz (R-UT), of the 15 lawmakers spearing the land transfer, is resigning from congress at the end of June 2017. ACT now to prevent land transfer legislation! Tell your friends and family about this problem – get the word out! Call or write your Senators and Representatives. Tell them to oppose any such legislation. How? Text 520-200-2223 with your zip to get your law makers phone number, or call the congress switchboard (202-224-3121) and use your zipcode to be connected to your representatives. Call (1-202-601-3839) or write Secretary of Interior and ask that Ryan Zinke stay true to his past statements that we should retain Federal ownership and control of our public lands. Talk to your city Chamber of Commerce and ask them to support public lands. Your lifestyle, job, passion relies on it. Write a Letter to the Editor that just explains how public lands affect you personally. Engage in your local democratic process and attend town hall meetings. Want to do more? Check out the Outdoor Alliance’s step-by-step how-to guide for taking action.